Graduation Projects that You Can Make! Affiliate links provided for your convenience. View my full disclosure policy here. I'm sharing two fabulous grad projects with you today. Let's start with this Commemorative Grad Wreath. I was inspired to make this after seeing the Grad Wreath on Joyful Scribblings. 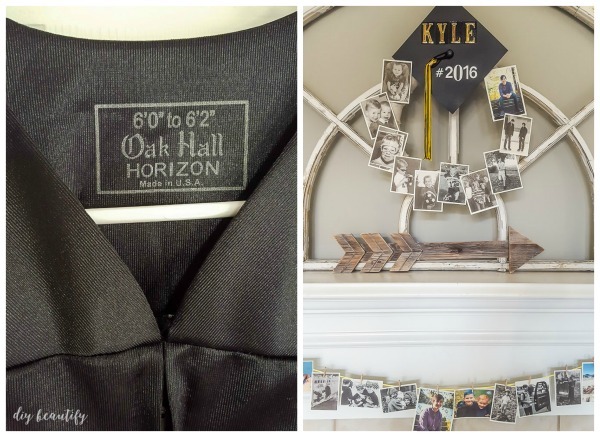 This graduation memory wreath is one of my top-pinned projects. 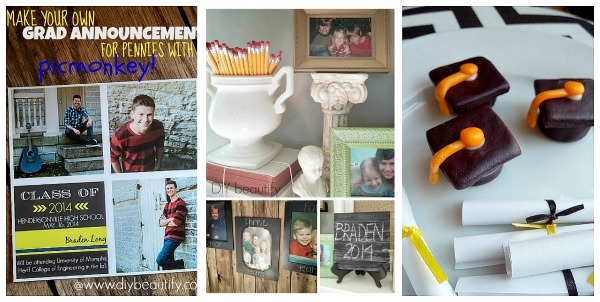 It's been featured at Joann, Better Homes and Gardens, Parenting and more! 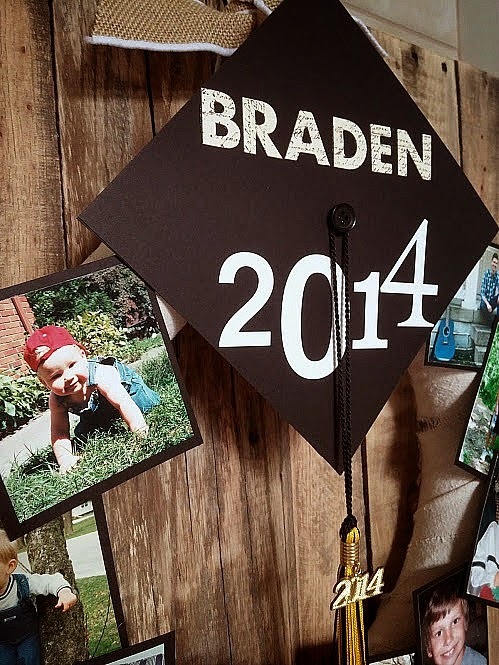 The grad cap (mortarboard) is heavy duty black card stock cut into a 7-1/2" square. I glued a black button onto a metal fastener and inserted the fastener through the middle of the paper square. 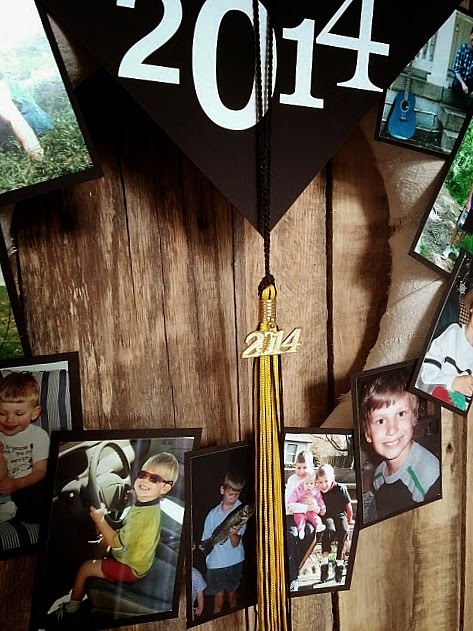 This elevated the button slightly so that I could easily hang my son's tassel from it. It's a cinch to just slip over the button, or remove it to actually wear it to graduation, hehe. Large white stickers spell out his name and the year. I collected favorite pictures of my son from birth through present and glued them to black card stock to give them structure, leaving a small outline. My paper trimmer saved me so much time on this part! I used a dab of hot glue on each mounted picture to attach them to the wreath form, overlapping them slightly. And that is it! Easiest (and most memorable) wreath ever!! It makes a huge impact, is totally personal, and fun to see how my son has changed over the years. 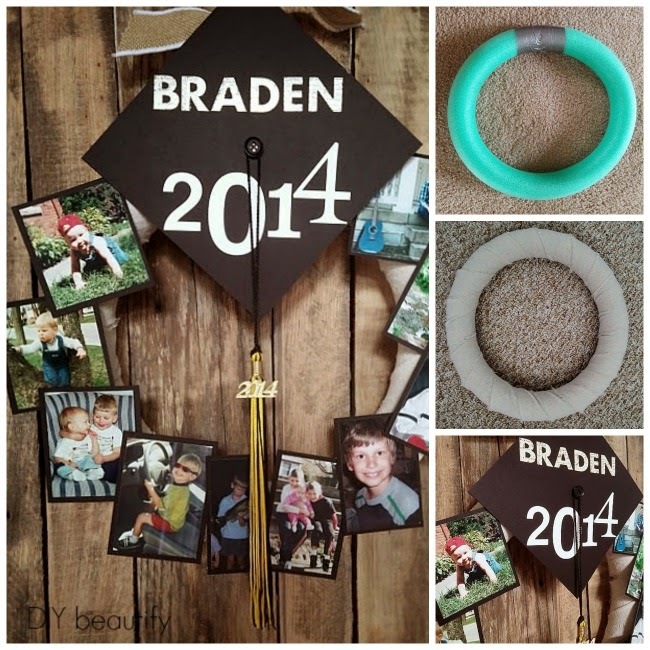 This memory wreath could be used for any graduation...kindergarten, 8th grade, college, nursing school, etc! Use your imagination and make it your own!! Update: another son of mine has graduated from high school! I made him a similar wreath, but used black and white photos to make it a little different. You can see how it turned out here. 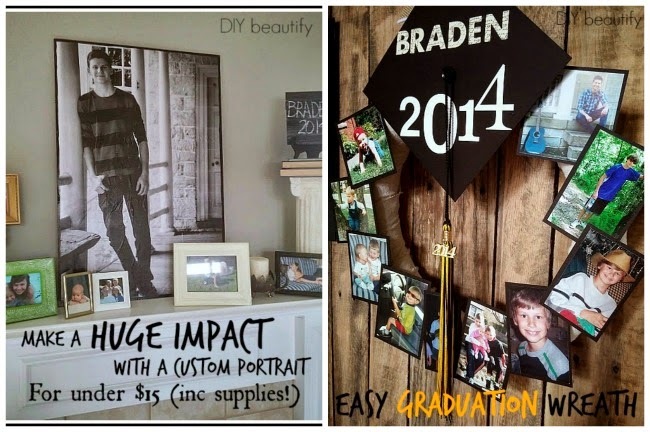 This budget project satisfied my desire for something bold (and inexpensive) at my son's graduation party. I made 2 of these large prints and they definitely made a statement! This (nearly) life size project involved taking my flash drive of grad pics to Staples and requesting Architects or Engineers prints (if you have a copyright on your pictures from the photographer, please don't ignore it...my pictures were all taken by a friend who gave me creative license to do what I wanted with them). Engineering prints are usually about $3.50 but they were having a sale and they were $3, woohoo! The prints are 2' x 3'...very large...perfect for making a statement. They are printed onto regular copy-type paper and they are only available in black and white. He came home with this weird wood that I'd never seen before called triply underlayment, with the pieces already cut to size. It's a nice thin wood. One 4' x 4' piece was enough for 2 canvases, and cost only $10, making each canvas only $5 each! And there's a nice strip leftover for another project (like a sign). 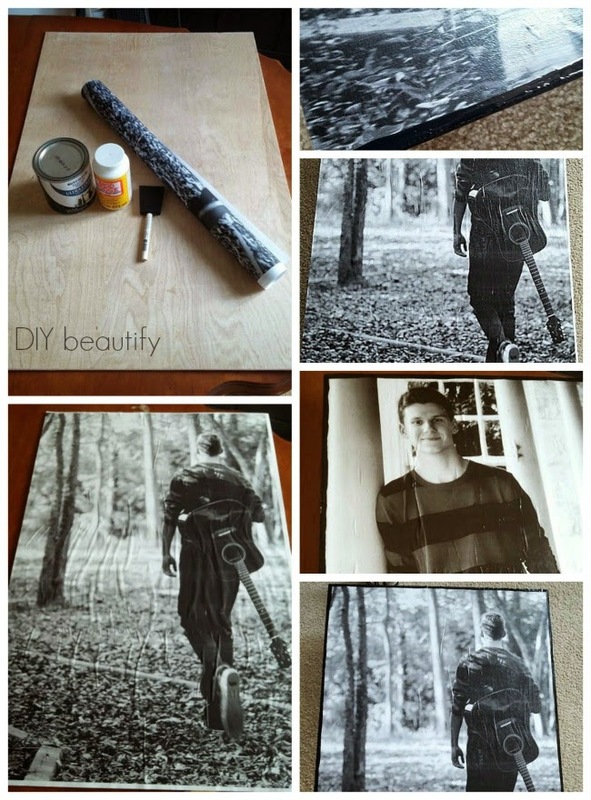 I would highly recommend before you begin adhering your print to your surface with Mod Podge to go online and do a search on Mod Podge Tips. There are YouTube videos and other tutorials that will walk you through how to properly apply it so that you don't get wrinkles. I didn't know this and didn't do it, so my artwork is quite badly wrinkled. Thankfully my darling graduate likes the rather 'grunge' look of it and told me not to worry about it when I was fretting over all the unsightly wrinkles. I brushed on a layer of Mod Podge and laid my print on top and smoothed it out as best as I could and then left it alone to dry (when I make another one, I'll roll my print up from top to bottom and apply it a little at a time, unrolling as I go and pressing to get the bubbles out). Aren't you happy you can learn from my rookie mistakes?! Once that dried I flipped it over and using a craft knife I cut off the excess paper that was hanging over the edges of my wood. The wood acted as a guide for cutting. Simple enough. Then I turned it back over, front up, and brushed a layer of Mod Podge on top of the print. I was going for some texture and decided to try a technique for creating texture on canvas I read about on Designer Trapper in a Lawyer's Body by pressing a small canvas directly down onto the wet ModPodge. This did give it a unique look as it dried. The wrinkles interfered a little though. After that was dry, I brushed black craft paint around the edges of the wood and up onto the print. When I had it printed at Staples, three edges had a white border so I wanted to cover that up. I gave the whole portrait a hand-painted border of black. I wasn't going for perfection....remember the wrinkles? You can see the texture that was created by pressing the canvas onto the wet Mod Podge in the picture in the top right hand corner. 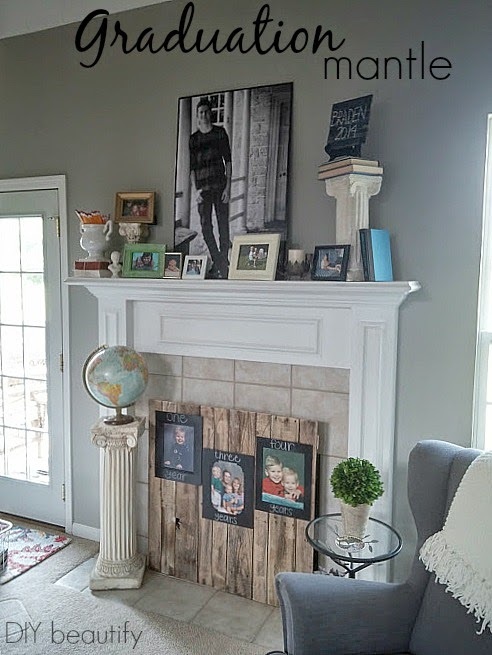 This one looks great as the centerpiece of my Graduation Mantle...I mounted the other portrait on a tall display easel just inside the front door. This officially ends my run of Graduation Themed projects! If I've inspired you today, please consider subscribing to my blog so that you never miss a post! Just click on the blue button below! Both are great. 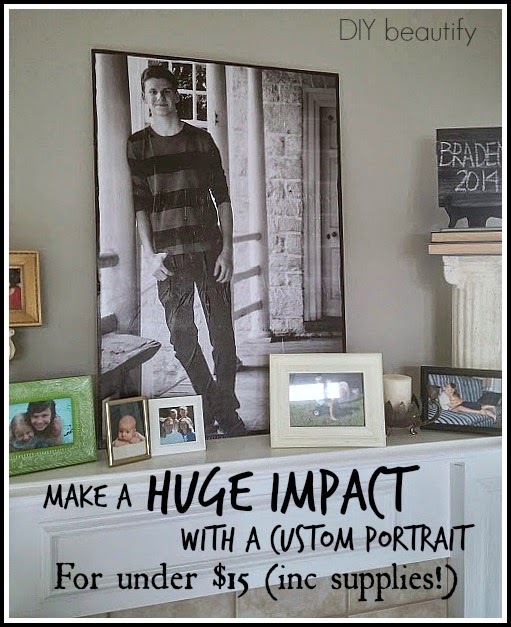 I especially love the large photo! thanks for sharing with SYC. Thank you; they were sort of last-minute projects but were fast and easy to do! 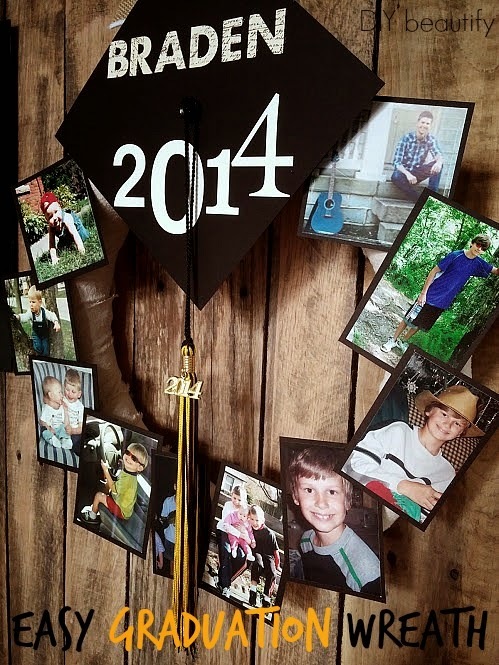 Love the wreath....think I may try this with my first born's grad party this year!! Loved the ideas! Did not get the great price break for engineer print. Was told photo uses much more ink, therefore I had to pay $20. Still loved the out come. Thanks for sharing! Thanks so much for letting me know your project turned out! I can't believe how much you had to pay for the engineer print! I wonder if they've raised the price because so many home decor enthusiasts figured it out?! What size was the grad cap, I’m thinking 12x12? TIA! Sorry for not including this info, I just updated the post. It was a 7-1/2" square; it will really depend on the size of your wreath; make it the size that looks best. Thanks for this tutorial. What did you use for a hanger on the back? I tied a ribbon around the wreath before attaching the mortarboard, and hung it from the tied ribbon! Really adorable wreath! What size letter/number stickers did you use and what size are the mats for each picture? Thank you Ria! The stickers are 1-2 inches tall. My pictures are about 3x4s and so the black mats are just slightly bigger. That is a wonderful idea Elaine! Thank you for sharing!